Salt prevents infection in a wound. When an interaction starts to turn ugly – either between you and another person or in a group situation – do your words try to help heal, preventing further toxicity from spreading? Too much salt ruins the soup. 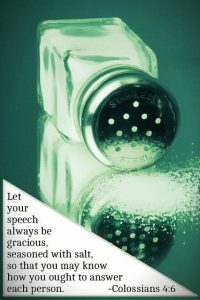 Although we are called to season our speech with salt, too much salt will not only spoil the soup but can overpower a conversation as well. Are we taking time to listen to others during interactions and pausing long enough before we speak to let the Holy Spirit interrupt and redirect our thoughts and words we speak? Before we speak words in person, or while texting or online, may we remember to let the salt of grace season our encounters today.